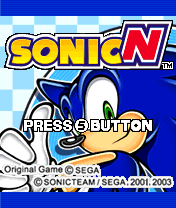 SonicN is a port of Sonic Advance to the Nokia N-Gage. It was a launch title for the N-Gage and was released in North America, Europe and Australia. Packaging is a box the same width and thickness as the popular DVD "keep case", but exactly half the height. Media for the game itself is an MMC ROM, which means that progress can be saved. English-language versions are not region coded. 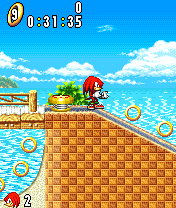 The game itself is identical to the Game Boy Advance version except for the exclusion of the Tiny Chao Garden and some tracks from the sound test. It runs a bit slower on the N-Gage hardware, and the screen resolution has been altered, which is considered an issue by some. The N-Gage's screen is portrait, so the most notable change in gameplay is the choice between a full resolution mode with a narrow view, or a letterboxed 4:3 mode with scaled-down graphics. Screen size toggling is only possible during gameplay and can't be altered until entering a level. Many fans and veterans of the game regard this as a lesser gaming experience. While copy protected, the protection was defeated within days of the release by a group calling itself Blizzard (no relation to the makers of Diablo II). This page was last edited on 10 April 2018, at 13:45.